When you’re accustomed to Rolex watches, a 42mm sized case is by no means considered small. Conversely, when dealing with Breitling men’s watches, 42mm sits, believe it or not, on the more restrained end of their spectrum. Take for example the Breitling Superocean Héritage II 42; this is the smallest offering in the collection alongside 44mm and 46mm sized versions! Let’s take a closer look at this new Breitling diver’s watch with a design that dates back to the 1950s. In the mid-twentieth century, Breitling was already known for their dominance in the military aviation space with a host of pilot watches, aviation chronographs, and aircraft instruments to their name. However, in 1957, the brand ventured into a slightly different direction with the introduction of the Superocean dive watch. Combat diving, professional diving, and hobby diving were picking up steam in the fifties; therefore the need for dive watches was also on the rise. Created to compete with the Rolex Submariner, Blancpain Fifty Fathoms, and Omega Seamaster launched earlier in the decade, the Breitling Superocean watches plunged into the dive watch space with 200-meter water resistance. 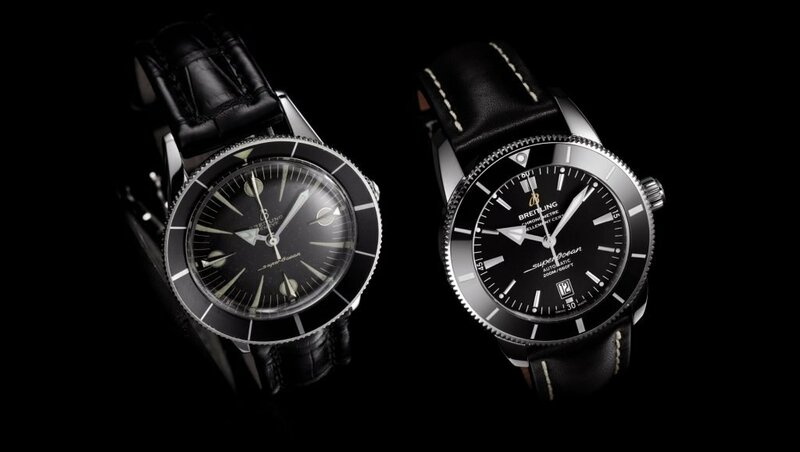 Breitling actually unveiled two versions of the Superocean—an automatic three-hander and a manual-wound chronograph. As a dive watch, the Superocean watches had all the typical traits needed for an underwater watch such as a rotating knurled bezel graduated to 60 minutes in order to record immersion times, a legible luminescent dial with oversized markers and hefty sword-shaped center hands, and a large 38mm case to house everything. The bezel was particularly intriguing thanks to its concave shape rather than a traditional flat surface. Plus, the steel mesh bracelet could withstand salty seas and look great out of the water too. Breitling continued to manufacture the inaugural Superocean models until they were replaced by the Superocean Chronograph ref. 2005 in the mid 1960s. For the 60th anniversary of the Superocean in 2017, Breitling presented a new Superocean Héritage II collection including two sizes, two types of functions, and three different colors to choose from. 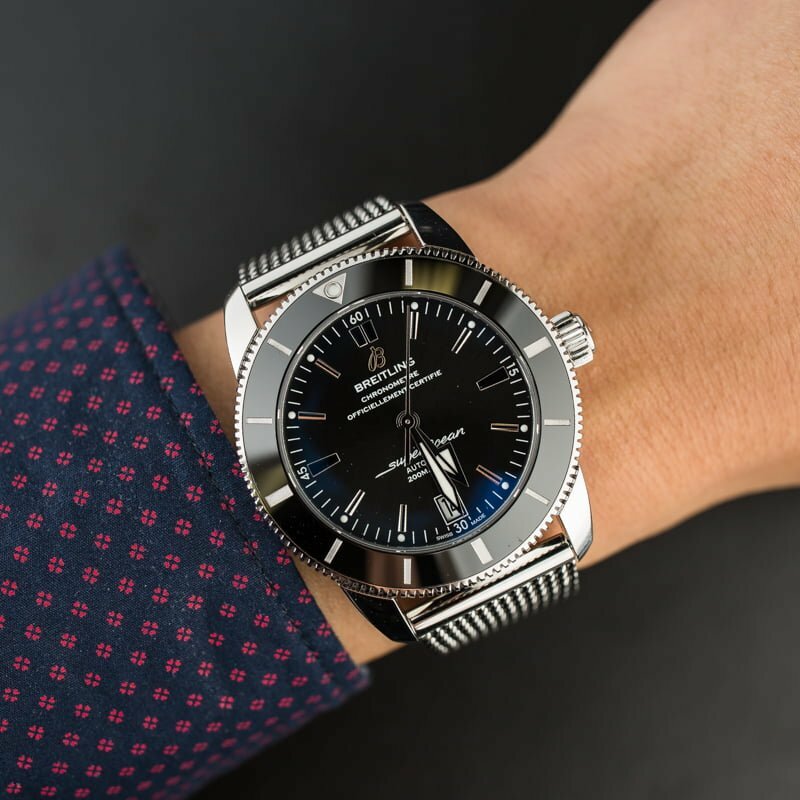 Taking the homage watch route, the new Superocean Heritage II watches use the vintage 1957 Superocean models as inspiration but of course, include modern functionality and flair. Among all the options, the most straightforward—and closest to the original time-only Superocean—is the Superocean Heritage II B20 Automatic 42 in classic black that we have here. We don’t have to look far to see the Superocean design codes that were established six decades ago brought back to life. There’s the marked black rotating bezel, but this time built in ultra-modern scratchproof ceramic. What’s more, the center sword-shape hands are similar in shape, but are even bigger to accommodate the larger dial size. Breitling also retained the minute track running the periphery of the dial, but did add a date window at 6 o’clock for day to day practicality. Finally, echoing the style of the very first Superocean watches, this modern Breitling dive watch also comes with a steel mesh bracelet. Water resistance remains at 200 meters but encased within the watch is the in-house B20 automatic movement with a generous 70-hour power reserve. Breitling has no shortage of timepieces built with the spirit of aviation in mind. However, the Superocean Heritage II collection reminds us that along with a focus on the skies, Breitling also had one eye on the deep.